Nutmeg’s last Listener featured the delights of mobile phone use, with that fun refrain “I’m on the train!” appearing on the diagonal. I’m not sure what to make of mobiles myself. My latest one allows round-the-clock internet access, which is both a blessing and a curse. Anyway, I won that one, which was nice. The clues weren’t too bad in this one, so I was able to make reasonably quick progress through the grid fill, but it did after all take a while to figure out how the Playfair code worked. MODRED was the first starred clue I solved, putting this firmly in the realm of King Arthur’s knights, but I didn’t really get enough to work with for a while so it took until later on Friday night to get enough material together to plug into Quinapalus’ Playfair breaker. OK, so I didn’t solve it by hand. So it was KNIGHT’S MOVE and not ROUND TABLE, or KING ARTHU(r), or EXCALIBUR or HOLY GRAIL or something. Oh well. But at least I was able to finish off the grid, find all the knights (cool name, Gareth), and decode those final two names hidden in the extra letters. And so it was only on Saturday morning that the significance of the Playfair code occurred to me, and that the letters of the names would be scattered a Knight’s move away from the last one. 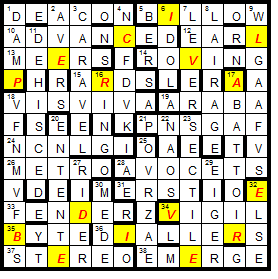 A few minutes later and I’d fixed my dodgy spelling of BEDEVERE and was all done. Nice puzzle, Nutmeg! This entry was posted on 8 August 2014 at 4:01 pm	and is filed under Solving Blogs. Tagged: Arthurian Legend, King Arthur, Knight's move, knights, Nutmeg. You can follow any responses to this entry through the RSS 2.0 feed. You can leave a response, or trackback from your own site.